To Embroider or not to Embroider? SewTara and I are planning to get together once a month this winter, to sew together, it was Tara’s idea and I’m looking forward to it! This is Winston (and DH in the background) whom we adopted from Peachy Pug Rescue. He joined us when he was 6, he’s 14 years old now and healthy with the exception of (easily controlled) food allergies. He’s been a wonderful companion and I hope he’s with us for another few more years. 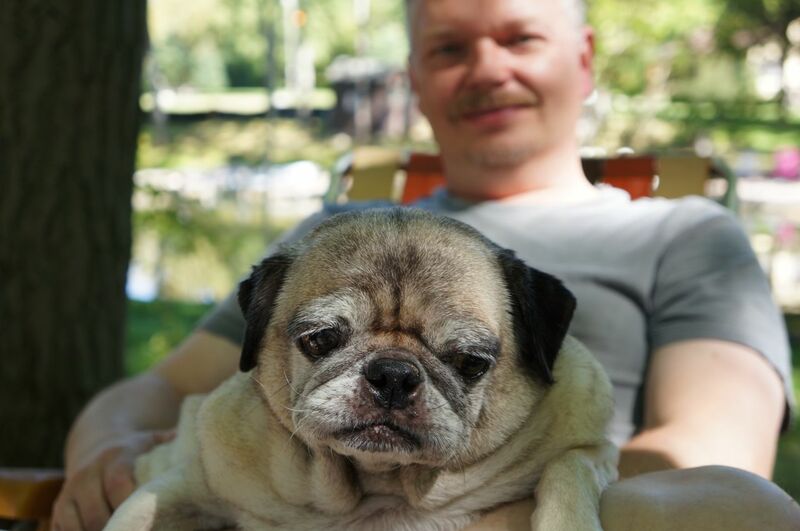 We adopted another Pug a year after we adopted Winston, Cookie, she was two at the time. She’s 9 now, full of beans and a little on the chubby side, like her Mom. ;D Adopting a mature dog is great, they come pre-trained and our two have had no problems bonding with us. What do you think of the new camera? This entry was posted in Emboidery, Fabric, Hexies, Pugs by Tabatha. Bookmark the permalink. 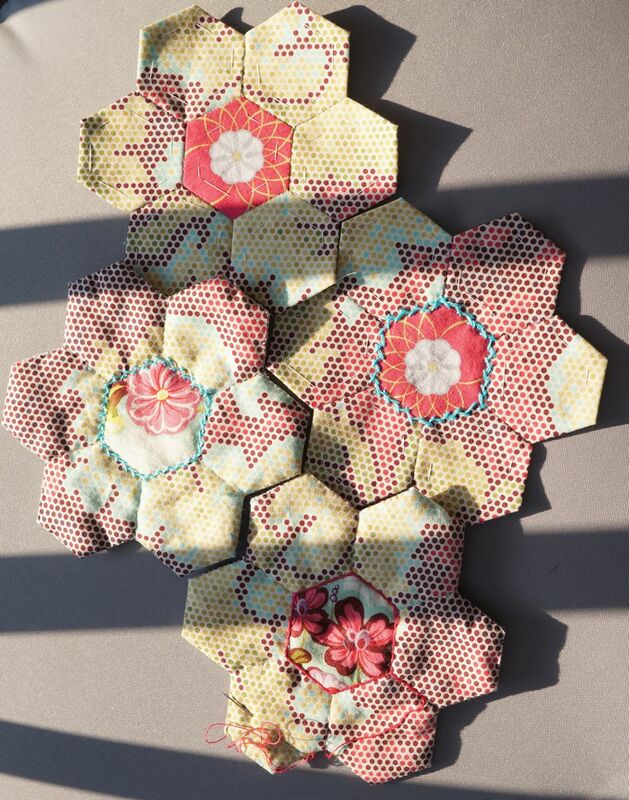 Those hexies are looking great! I love the herringbone stitch and I agree with you that the straight stitch doesn’t do much for it. I think the fuchsia in herringbone would look great too though, from what I can see. As for whether to embroider or not, couldn’t say– both look fabulous. Looking forward to seeing what you decide to do. Such a cute pug! I like the herringbone stitch in turquoise. It adds a nice little something. Nice camera! What kind is it? I need to put a different camera on my wish list.